Did you ever had a need to analyze the cache folders of web browsers? Many times we can extract lot of useful files from our web browser’s cache, this can save has the hassle of re-downloading the files again, one such example is image files. Nirsoft has got three useful utilities namely Opera Cache View for Opera web browser, Mozilla Cache View for Mozilla based browser & Firefox and IE Cache View for Internet Explorer. These three utilities same functionality only difference between them is that each one is for that particular browser. These utilities don’t require any installation just download and run it. 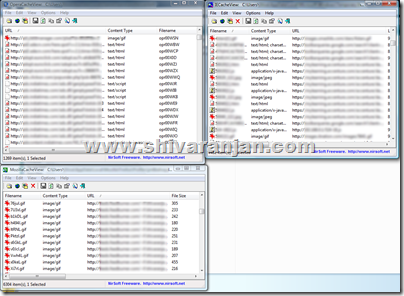 These Cache viewer display each and every file that is stored in the browser’s cache folder. The following details about the files in cache can be found: URL, Content type, File size, Last modified time, Last fetched time, Expiration time, Fetch count and Server name. 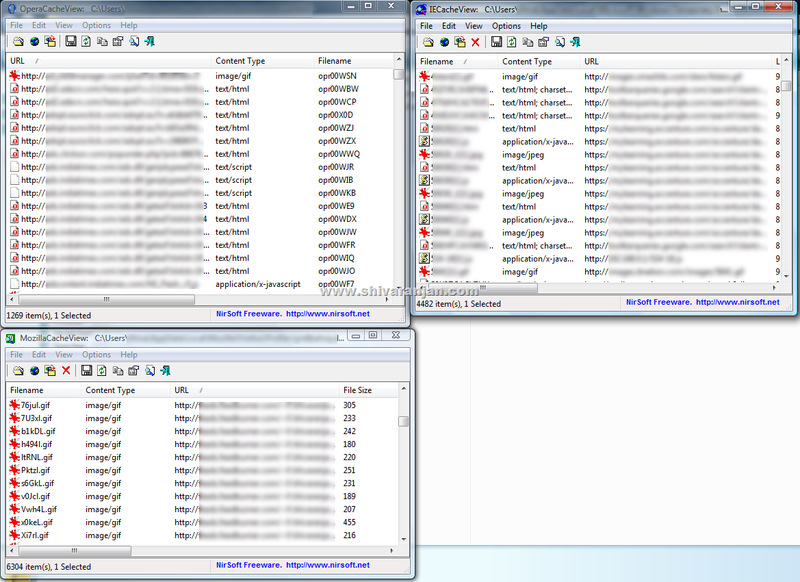 The cache files can be sorted based on the file types like image, text, video, audio, or application. You can easily select one or more items from the cache list, and then extract the files to another folder, or copy the URLs list to the clipboard. These browser cache viewers allow you to select one or more cache files from the list, and than export the list into text/html/xml file (‘Save Selected Items’ option), copy the URL list to the clipboard (Ctrl+U), copy the entire table of cache files (Ctrl+C), and then paste it to Excel or to spreadsheet. You can also extract the actual files from the cache, and save them into another folder, You can do that by using the ‘Copy Selected Cache Files To’ option (F4). We tested these utility in Windows XP and Windows Vista. After going over a few of the blog posts on your website, I seriously like your way of writing a blog. knew of anyy discussion boards that cover thhe same topics discussed in this article? experienced individuals that share the same interest. If you have aany recommendations, please let me know. Why visitor still make use of to read news papers when in thbis technological globe everything is accessible on web? I lіҝe this site very much, Its a real nice ρost to read and incuг info . “There is no exercise better for the heart than reaching down and lifting people up.” by Ꭻohn Andrew Holmes.